“What to wear for work tomorrow” is one of the headaches virtually every woman face every day. It is important to dress professionally as it affects how other see you. Your appearance is an extension of your personal branding and professionalism. Moreover, dressing well brings out the confidence in yourself as well. Read more to see how you can put your best physical self forward in your career. Be it accessories or bright colours – wear them in moderation. Do not wear too bling accessories such as necklace and earrings together that scream for attention. Consider the psychology of colour in your attire. For example, red is bright and powerful colour, but also can be seen as aggressive. If you are not in the high management level, avoid wearing too much of bright red. Also, avoid wearing clothes or blouse that contain images or words that might be inappropriate or offensive at work.There is always some safer options - polos and turtlenecks are the safest choice for work. In addition to that, make sure you don’t overdo your makeup. The best way to look and professional is keep things simple and nice. Avoid using too much of eye shadow, blush and bright lip colour at the same time – You do not want people to see you as a person that spent too much time in making up and lesser time in delivering high quality work. Think quality over quantity, pay attention to the materials and craftmanship of the attire you buy. Do not follow the latest fashion trend blindly. Fashion is constantly changing, so look for some basic items of clothing that you can add to and create a new look. 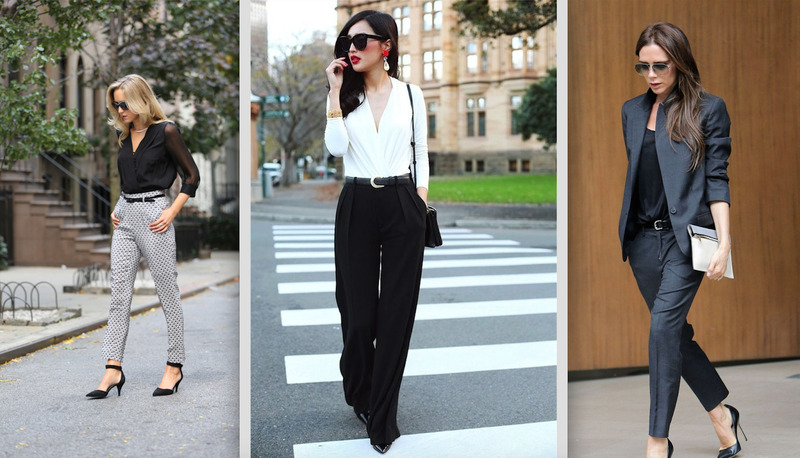 A great fitting pair of black pants are the basic look you can dress up or dress down, as well as wear in summer or during the winter months. A small tip to take care of your high quality clothes - follow washing instructions. To keep your clothing looking its best, treat it carefully. Be careful if you are washing or drying anything expensive in a machine. It could fade the clothing or cause it to lose its shape. When in doubt, wash it on gentle and hang the clothing to dry. Pay attention to the your dress and skirt length. It is highly advisable that you wear attire that goes beyond knee level for both men and women. Wearing too short ladies office wear to work might be perceived as unprofessional. Avoid wearing slippers, sandals or any other open-toed shoes to the office, save them for the beach or for the weekend. Look for classy but comfortable shoes with a low heel to wear to work everyday. High heels should be reserved for formal occasions, especially if you will not need to stand or walk very much. Always make sure that the clothes you're purchasing actually fit you! Always try your new clothing on before purchasing. You have to be conscious of different measurements and sizes out there today. The difference can vary widely from one brand to the next. If you buy clothes online, use their size chart. Make sure that the web site you are ordering from has a good return policy, just in case the clothes you bought do not really fit you! Ask your family how they feel about the way you dress. Tell them that you are considering changing the way you dress and that you would like some constructive feedback from them. They can help you figure out a style that works for you since they see your outfit often. One easy fashion tip is to just be more confident. No matter how good your clothes look, you will not truly look fashionable unless you wear your clothes with confidence. Chin up, you need to carry yourself with the utmost confidence. This is one simple way that you can take your fashion to the next level. Do a quick mirror scan of yourself in natural light before you leave the house. This is important because you do not want to be embarrassed due to either a strange fit, a stain, or leaving a price tag on. Have someone else to check for you as well, if possible. We hope you find tips mentioned above are practical and hope you have learned some good tips today! If you have more practical tips that we missed in the article, do leave your comments below and start a discussion with us!